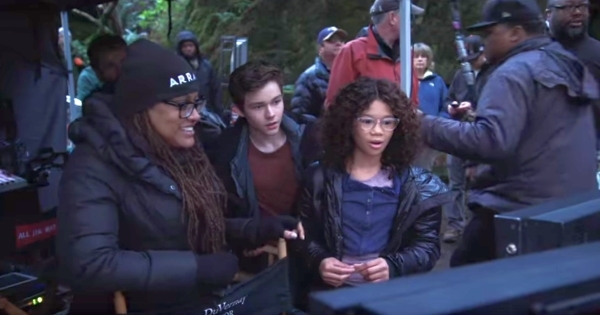 A new behind-the-scenes featurette has been released for Disney's"A Wrinkle in Time" movie. It features interviews with director Ava DuVernay, Oprah Winfrey, and Mindy Kaling. "It's a story about a girl they make she's imperfect she's all of us she's in a package that's much different than most cinematic heroes," Director Ava DuVernay says about the adaptation of the classic novel. "A black girl with curly hair and glasses. It's the idea that any of us can be a hero"
"I've never been part of a movie where the diversity represented on camera and off camera is so effortlessly inclusive," says Mindy Kaling who plays Mrs. Who. The video shows various beautiful scenes, videos of them shooting in exotic locations and the hundreds of people involved in making the movie. Oprah Winfrey who plays Mrs. Which says, "This great adventure of a film has been one of the great adventures of my own life can't do better than that." She's right. This movie looks breathtaking and ground-breaking. What do you think of the behind-the-scenes clip?